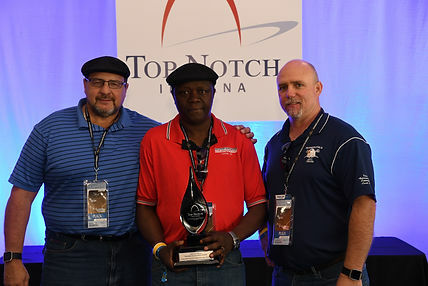 Top Notch of Indiana honored excellence in construction at the ninth annual Top Notch Standards of Excellence luncheon held at the Indianapolis Motor Speedway on May 17th. The event honored construction unions, contractors, apprenticeship programs and the spirit of labor-management partnership in the union construction industry. Iron Workers Local 22 in Indianapolis won the Training Excellence Award! The Top Notch Standards of Excellence Awards program was developed by Top Notch of Indiana for the purpose of recognizing achievements in Indiana's union construction industry and bringing together labor, management, ownership and leadership segments of our industry. This unique event not only celebrates excellence in union construction, but allows all members and associates of our industry to exchange ideas and become better acquainted in a fun, relaxed atmosphere. The Top Notch Standards of Excellence Awards Program is the only event in the Indiana Union Construction Industry attended by all segments of the industry, providing an unmatched networking opportunity for all attendees.